Get their name from their horns. 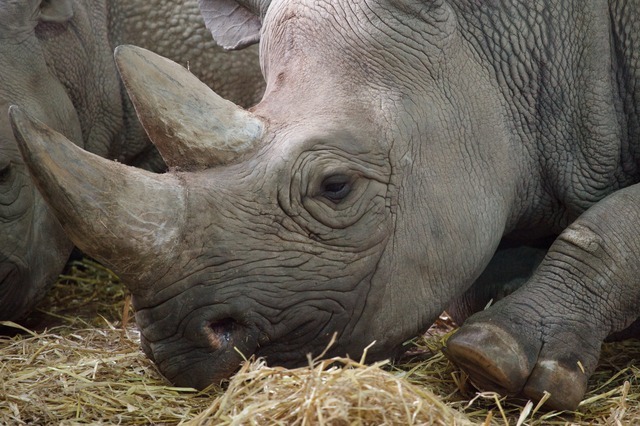 Rhinoceros comes from the Greek rhino (nose) and ceros (horn). White rhinos are considered to be the second largest land mammal (after the elephant). White rhinos are actually grey. Black rhinos and white rhinos are the same colour. The horn is thickly matted hair, growing from the skull. Have poor bad eyesight, but good hearing. Like to roll in mud to protect themselves from sunburn. Black rhino eat leaves, buds, shoots, bushes and trees. Can live 40 - 50 years. Only charge when they are startled, otherwise they are even tempered animals.